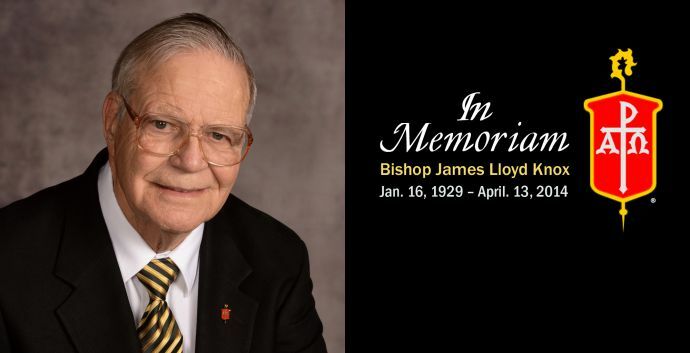 James Lloyd Knox, a retired United Methodist bishop who was known as a champion of mission, died at age 85 on April 13. He served the denomination in various capacities and locations, but is well-remembered for his work in his native Florida. Two memorial services are planned for Knox. The first will be at 10 a.m. Wednesday, April 16, at Gadsden (Ala.) First United Methodist Church, and the second will be at 2 p.m. Saturday, April 26, at Hyde Park United Methodist Church in Tampa, Fla.
Knox was born in Tampa in 1929. He was elected bishop in 1984 and served in the Birmingham, Ala., episcopal area until 1992, when he was appointed to the North Georgia Conference. After his retirement in 1996, Knox served as interim bishop in the Florida Conference in 1999 and again in 2000-2001 following the illness and death of Bishop Cornelius L. Henderson. "I was grateful to come to know Bishop Knox over the past two years,” Carter said. “He was encouraging to me as I was getting started in his beloved state and home conference, and was an example of how one takes up a leadership role for the sake of others." Knox and his first wife, Edith, were missionaries to Cuba and Argentina from 1958 to 1964. He served the Florida Conference as coordinator of the Florida Spanish Ministry and superintendent of the DeLand and Miami Districts. In Cuba, Knox served the Santiago de las Vegas Circuit. In Argentina, he was pastor of congregations in Lomas de Zamora and superintendent of the Buenos Aires South District. His experiences in those countries made him sensitive to the needs of people in the United States who do not speak English, according to an article by Religion News Service in 1993. At that time, he was opposing a bill that would make English the official language of Georgia. “Having lived in another country, I understand how overwhelming it is not to be able to function in your own language,” he said. Thomas Kemper, top executive, Board of Global Ministries, said the mission agency's staff, directors and missionary community “stand in deep appreciation” of Knox, who served as president of the World Division from 1988 to 1992. The Rev. Clarke Campbell-Evans, director of missional engagement, Florida Conference, credits Knox with setting him on a path to mission work and church leadership. When Campbell-Evans was 17 and active in youth leadership at a church in Tampa, Knox invited him to meet with migrant citrus pickers who lived in deplorable conditions, with no running water and sometimes only blankets hung for a door. Knox, then pastor at Hyde Park, spoke Spanish and took the time to listen to the people in the fields. “Here was the pastor of a church who was saying the walls of the church are not important. We’re going to be the body of Christ,” Campbell-Evans said. Campbell-Evans said that field visit inspired him to follow in Knox’s footsteps as a missionary and later an urban minister in Miami. The Rev. Jim Harnish, pastor at Hyde Park, said Knox’s ties to the Tampa church go back to the late bishop’s teenage years in the 1940s. Knox was not from a church-going family but showed up at Hyde Park to join the Boy Scouts troop there and became active in the congregation. “He experienced his call to ministry here,” said Harnish, a long-time friend who expects to preside at the Tampa memorial service. Knox graduated from Florida Southern College in 1951 and went on to earn a master of divinity degree from Candler School of Theology. In addition to his work with the Board of Global Ministries, Knox served as director for the denomination’s Board of Church and Society and commissions on Religion and Race and Christian Unity and Interreligious Concerns. He was a member of the Human Relations Commission of the State of Georgia and a trustee of 12 colleges, including Clark Atlanta and Emory universities. Knox and his first wife, Edith, who died in 2008, are survived by two children, Richard Michael and Carol Anne. He also is survived by Julia Nolen, whom he married in 2009. Memorial gifts may be made to Alfalit International, 3026 NW 79th Street, Miami, FL 33122. Gilbert is a multimedia reporter for United Methodist News Service. Susan Green, editor, Florida Conference Connection, contributed to this report. Contact Gilbert at (615)742-5470 or newsdesk@umcom.org.